This month's free pattern is for the man in your life. I really love this style of tie! 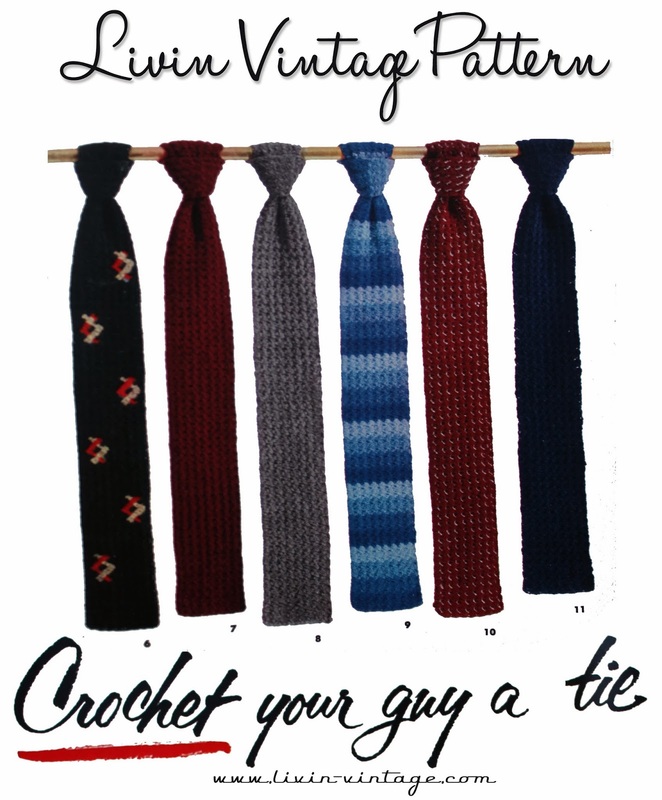 I am offering, for FREE, the pattern to make the tie on the far left. Would make quick and sweet Christmas present. Pattern is formatted to fit on a 8.5" x 11" paper. Feel free to link to this pattern, pin on pinterest, or send your friends here. This pattern may NOT be reproduced for sale or reposted/redistributed in any form. The tie MAY be made for sale from this pattern, but please give credit to Livin' Vintage for the use of the pattern. Have you taken the etsy shopper survey yet? Take it and be entered for a chance to win $25 to Livin' Vintage Shop! Hi, love the pattern but it references the directions from the solid ties. How is this finished off, etc.? I'm also tying to figure the decrease as well to end the tie? The pattern is not complete, it's missing the first round of decreases. Do you decrease at both the beginning and end of the tie to make the knot, seeing as the end is a straight edge?